Picture this. 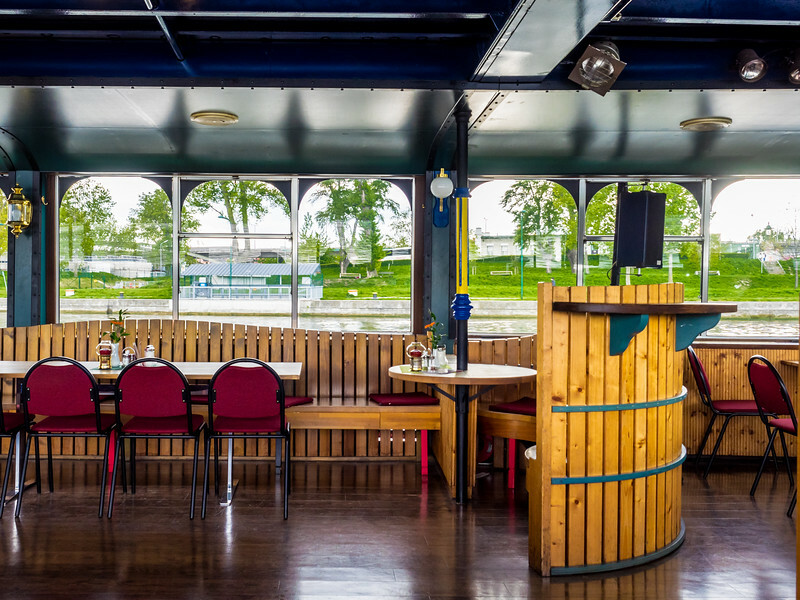 You're sailing along the beautiful Danube on a Vienna river cruise with a cocktail in hand. Now imagine that you'd been walking the city streets of Vienna for days, so your feet hurt and muscles ached. 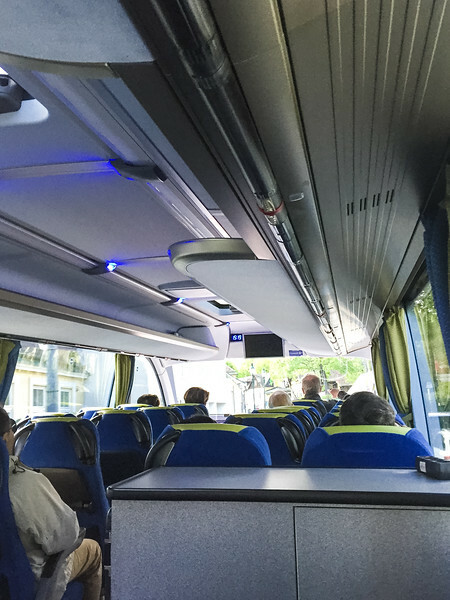 You've just ridden on a city-wide tour in the most comfortable bus ever, so you're already pretty relaxed when you stepped foot aboard the cruise. Now, you're feasting your eyes on views of the city's skyline and waiting to approach the storied locks. Open your eyes. 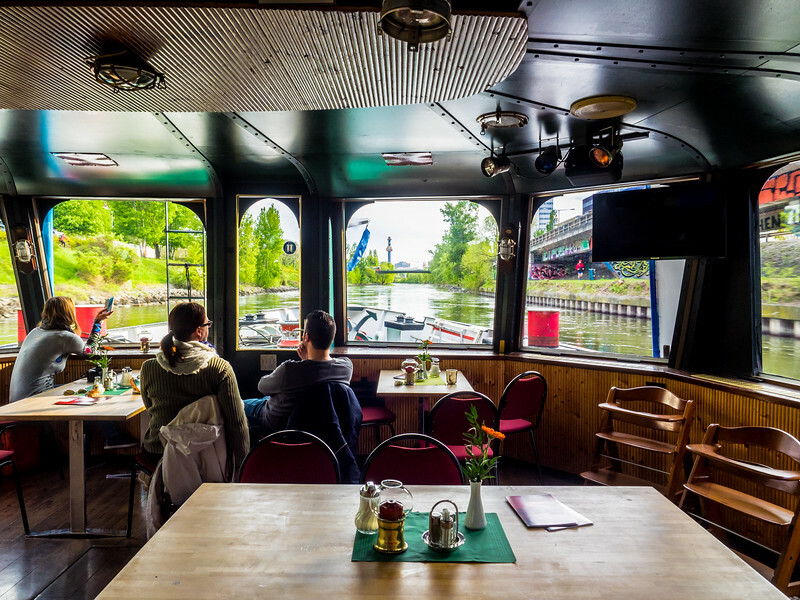 No, unfortunately, you're not actually on a Vienna river cruise. You have to go to Vienna to do that, which is just what we did! Disclaimer: Vienna Sightseeing sponsored this content. The ideas and opinions expressed in this post, however, are entirely my own. Some of the links included in this post are affiliate links. By purchasing products using these links, you can support a Cajun in Cali at NO cost to you. Getting the goods you want while showing support is the best of both worlds! 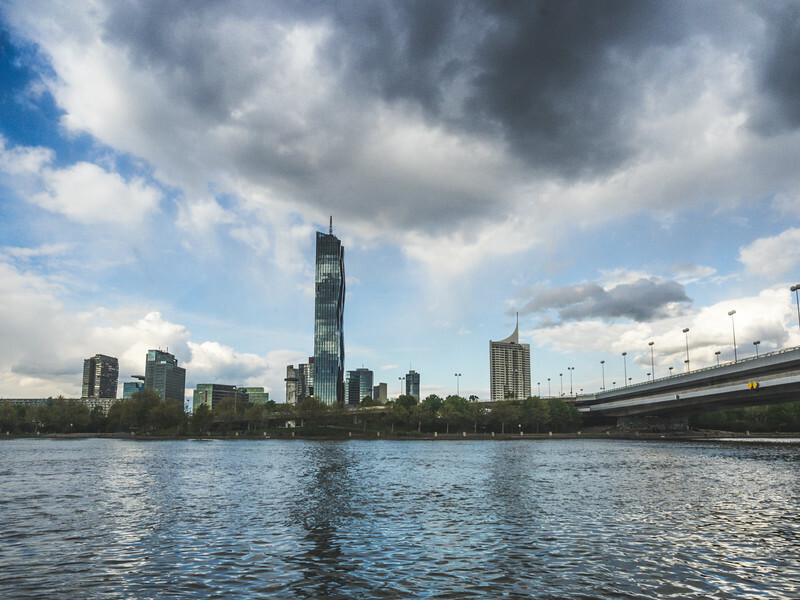 Why Choose a Vienna River Cruise? For years I've heard about the beautiful Blue Danube, but never in my wildest dreams did I believe I'd get the opportunity to sail along the banks of the famous river. But when the chance to visit Vienna came up recently, I took full advantage and started looking for a Vienna river cruise straight away. The Danube River is a major part of the history of Vienna. For years, it's inspired artists, musicians, writers, and other creatives. 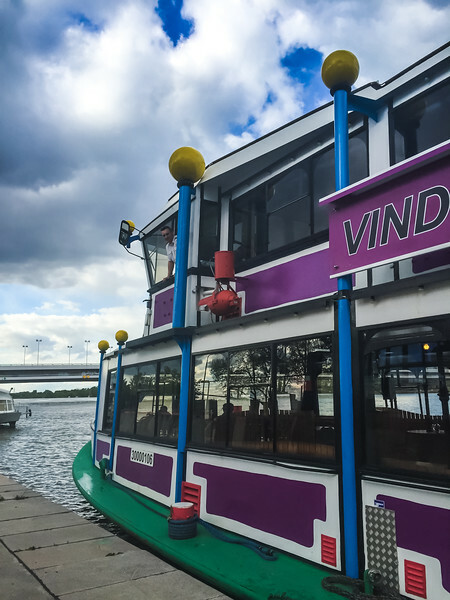 Experiencing the Danube River was one of the things we wanted to do in Vienna, so it made perfect sense that we chose a Vienna river cruise. Eager to make travel plans, I reached out to Vienna Sightseeing, the premier tour company in Vienna, about their Danube Panorama Tour. Not long after, we were registered for a relaxing bus ride through local vineyards to a panoramic point, followed by a sunset along the banks of the Danube! 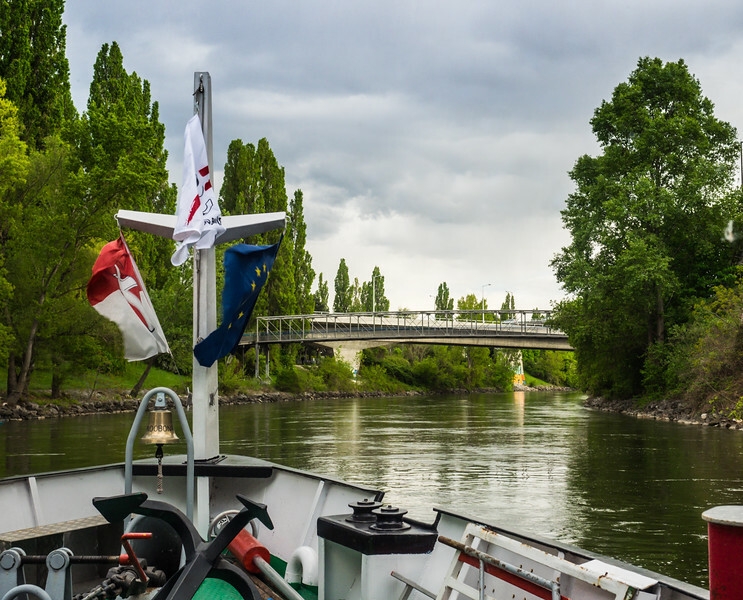 Which Vienna river cruise to choose? 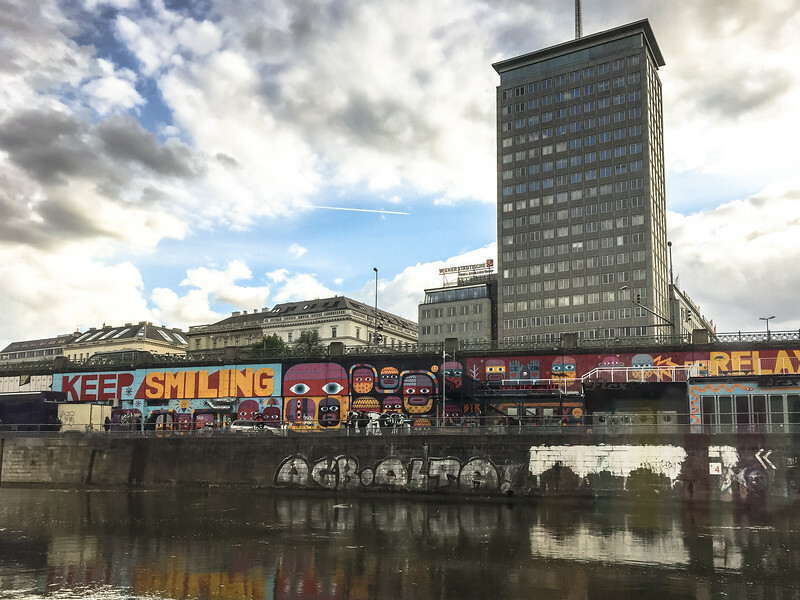 Vienna Sightseeing offers several tours that incorporate the Danube River, but there was only one that caught my eye: the Danube Panorama Tour. The 3.5-hour tour includes a bus ride through historic districts and areas of Vienna that tourists don't typically see. It arrives at Cobenzl, an elevated park that overlooks the city below and provides the perfect spot for that amazing panoramic picture of Vienna. But the tour doesn't end there! Board the bus again and go winding back through the city to the banks of the Danube river. There a chartered boat awaits, ready to take you on a slow and scenic tour of the river. The tour began at the Vienna Sightseeing Hop On Hop Off bus stop at Opernpassage, a large underground passage below the ring road just outside the State Opera House. The pickup location was straightforward and easy find. 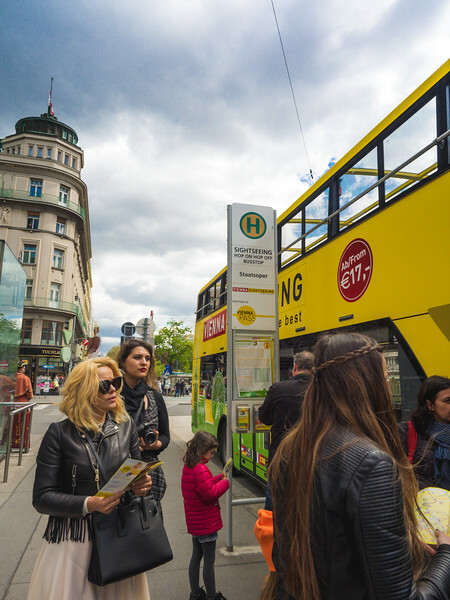 Staff stood beside the bright yellow Vienna Sightseeing bus ready to help customers select the Vienna Sightseeing experience that best suited their needs. Once we were on our way, our knowledgeable tour guide began sharing tons of unique information about the city. Vienna must be a tour guide's dream come true; it's full of many historical sites, famous museums, and hallowed halls. Our guide knew so much about the city's history. He shared some of the lesser known facts about the political and social movements that helped revolutionize Austria and Europe. This information helped shed new light on some of the places we later explored. Slowly and cautiously the large bus inched along the narrow streets of the Innere Stadt, or Center Streets. Along the way, we passed countless monuments, squares, and museums. Over time, the scenes outside the window became more modern. The closer we got to our first destination, the more residential the neighborhoods became. Getting the opportunity to see another side of Vienna was incredibly exciting. As we drove through the neighborhoods, we listened attentively to our guide point out homes once occupied by Einstein, Beethoven, fascist radicals, and socialist movements. By far the most memorable, though, was the view at the end of the bus ride. When the bus stopped at the panorama park, I instantly realized why this tour is so popular. The views of the city and the valley of vineyards below are unparalleled. We had plenty of time to look around and snap some fun photos of the fantastic view before climbing back into our chariot. Back on the bus, we backtracked through the residential areas, once again enjoying glimpses of daily Viennese life that dot the roadside. Overhead, we heard the guide giving plenty of tips for tourists looking to return to the vineyards via public transportation. He even taught us how to spot when a winery is open for tastings. Once at the water's edge, we found our next method of transport merrily bobbing in the Danube. Eagerly, everyone boarded ready for a bathroom break and a beverage. I was surprised to discover that the entire boat was enclosed, as I was hoping to find a clear view to take photographs. Thankfully, the windows were clean enough to shoot through. 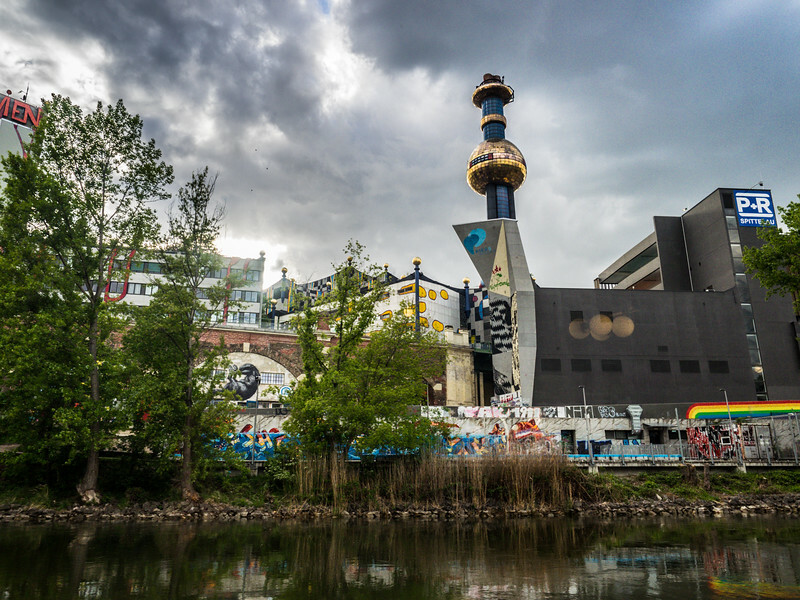 As we set off on our journey, the skyline of contemporary Vienna took shape. We easily recognized a few of the buildings pointed out by our guide during the bus ride. Meanwhile, the suspended television monitors and overhead announcements gave a more detailed history of points of interest along the way. The landscape along the Danube was not exactly what I'd call picturesque, at least not at first. Industrial areas make up the first few minutes of the river tour after leaving the city center. But, as the cruise continues, the landscape and scenery changes to more residential areas and riverfront parks that residents could be seen enjoying. The lush, green river banks reminded me of Louisiana. The Danube River has been a critical part of the city's development since the birth of Vienna in 500 BC. Today, the Danube remains one of the most trafficked river systems in all of Europe. Cruise ships and cargo vessels continue to use the river to this day for industrial and recreational activities. We got to enjoy the marvels of modern engineering at one of the many locks along the 1,777-mile waterway. Once we were through the lock, it wasn't long before the scenery began to change drastically. The open fields and industrial landscape gave way to lightly wooded river banks, lush and ever-so-slightly overgrown. Narrow pavements stretched on either side of the river, along which runners whizzed by park benches lined with elderly Austrians. A golden light began to fall on the eastern side of the river, illuminating the end of our Vienna river cruise. Once again, the scenery dramatically changed as we approached the finale. Street art peeked out from the cement retaining walls that lined the river. Political statements, cartoon-like characters, and bright colored graffiti stole the show. 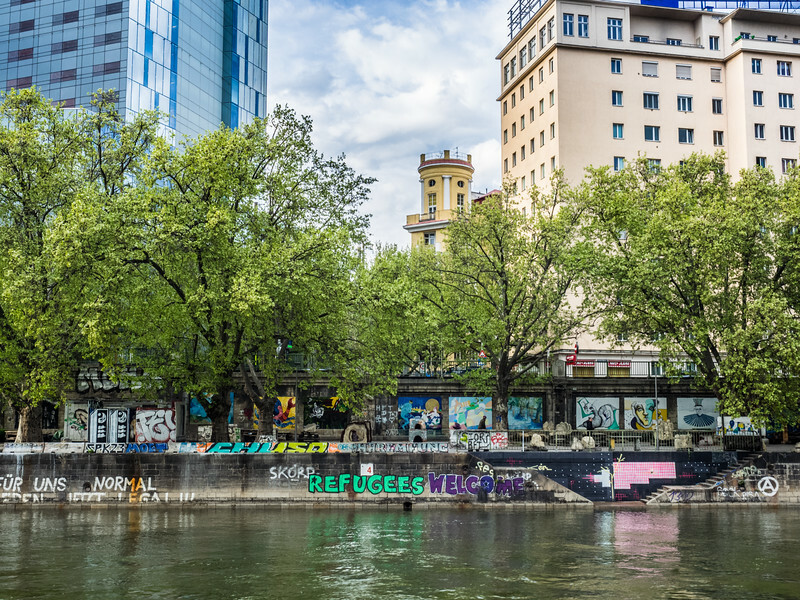 As the boat inched along toward the dock, we studied the street art hoping to understand underground Vienna better a little better. Walking away from the dock, we began to realize how relaxed we were. Our feet could carry us the few miles back to our apartment now. It sounds like you got to really see so much of the city. I take that back, the whole area. We love seeing cities by water! I love the variety of transportation. That’s always one of my favorite things about exploring a new place: seeing it from the road, the tracks and the water. And Vienna sounds awesome.